Delivery £2.75 for this item (Inc. VAT), or FREE if you spend over £20. 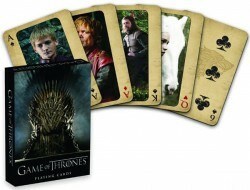 Contains great character photos from the hit HBO show of this very popular book series. Based on the first season. Varys and Littlefinger are the Joker cards. The cards are high quality and feature all the major characters (and some minor ones too).